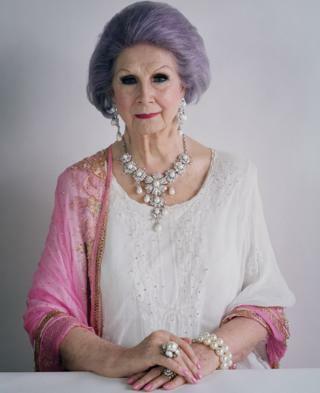 A portrait of transgender icon and former model April Ashley has become a permanent part of National Museum Liverpool's collection. Ms Ashley, who was born in the city, was one of the first Britons to undergo gender reassignment surgery in 1960. The photo was featured in a recent Museum of Liverpool show about her, which drew almost a million visitors. Museum deputy director Jen McCarthy said in acquiring the portrait "we welcome her home once again". Following her surgery, Ms Ashley became a successful model, working with photographer David Bailey on underwear shoots for the magazine Vogue. However, a friend sold her story to the Sunday People for £5 in 1961, a move that ended her career in the UK. In 2012, she was made an MBE for services to transgender equality, which she described at the time as "astonishing". Ms McCarthy said there was "no doubting that April is an exceptional person". "In accessioning Tim Walker's stunning portrait of April into our collections, we welcome her home once again." The portrait was part of arts and social justice organisation Homotopia's exhibition at the museum - artistic director Gary Everett said the purchase marked the end of a special year for Ms Ashley. "April joined us in Liverpool to celebrate her 80th birthday this year and was then awarded the Citizen of Honour by Liverpool's Lord Mayor. "We are delighted that a portion of our original exhibition is to become a permanent fixture in Liverpool's cultural heritage." The portrait will be added to the museum's collection on Friday as part of a ceremony for the International Transgender Day of Remembrance.